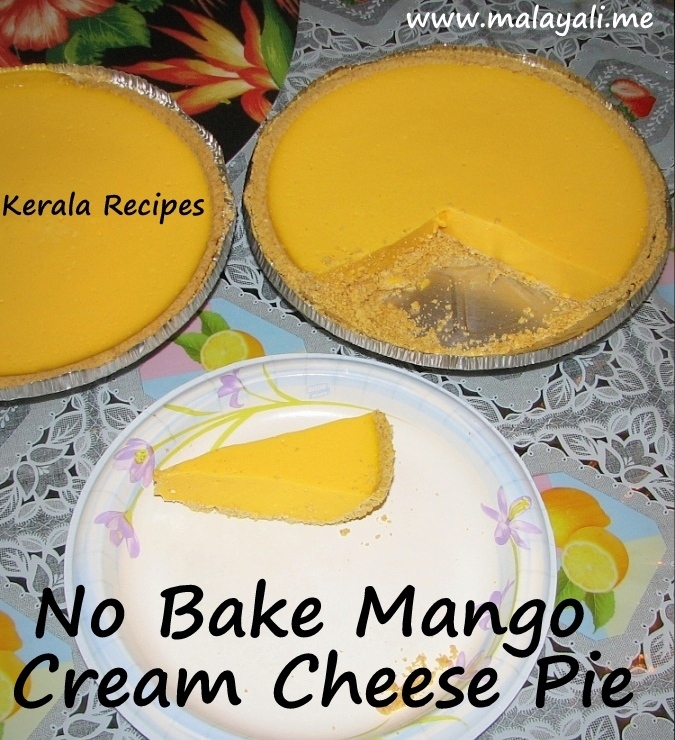 When we visited our cousins in NY, I happened to taste this lovely Mango Cream Cheese Pie. I was hooked onto it and asked my cousin for the recipe. I was surprised that it was so easy to make and there was no baking involved. All you need is to use ready-made Pie Crusts. Most of the ingredients were new to me and I had to explore my Grocery Store thoroughly to find all of what was needed. Even if you don’t like Cheese, you will like this dessert. Cream Cheese has a mild, distinct flavor. Condensed Milk will make the filling taste more creamy and less cheesy. This No-Bake Mango Cream Cheese Pie has a soft and dense filling. This dessert is also suitable for those who do not eat eggs. Allow the cream cheese to sit at room temperature for a few hours so that is softens. Add the gelatin to 1 cup of hot water. Stir thoroughly until dissolved. Allow it to stand for a while. Beat the softened cream cheese, condensed milk, gelatin and mango pulp. Make sure that the cream cheese is soft otherwise it will not beat well. You can also use a blender to combine everything. Do a taste test and add sugar only if needed. Pour the mango cream cheese filling into pie crusts. Refrigerate for 4 to 6 hours or until set. Condensed Milk is optional in this recipe. If you want the taste of cream cheese to stand out, you can skip the condensed milk. The best part is that you can make this dessert without the pie crust and serve it as a simple Mango Cream Cheese Pudding. You can also use 1 tub – 8oz of Cool Whip (Whipped Topping) instead of Condensed Milk. Vegetarians can use Agar-agar instead of gelatin.